Founded in 1981 in Apples, Switzeland, Logitech designs, manufactures and markets personal interface products that enable people to effectively work, play, and communicate in the digital world. The Company's product family includes Internet video cameras, mice and trackballs, keyboards, headsets and speakers, interactive gaming devices and 3D controllers. With operational headquarters through its U.S. subsidiary in Fremont, California, and regional headquarters through local subsidiaries in Switzerland, Taiwan and Hong Kong, Logitech International is a Swiss public company traded in Switzerland on the Swiss Stock Exchange under the symbols LOGN and LOGZ, and in the U.S. on the Nasdaq National Market System (LOGI). The company has manufacturing facilities in Asia and offices in major cities in North America, Europe and Asia Pacific. Their origin lies in the OEM sector and during the past few years Logitech has made his presence in the retail sector and now they are having distributions in more than 100 countries all over the world. New benchmark in optical systems combines high resolution and high frame rate to achieve superior performance. Ground-breaking new engine captures more data every second, measuring even the smallest movement. 800-dpi sensor ensures unparalleled accuracy. Advanced digital radio technology provides the performance of a corded USB device within a six-foot range. Rapid charge base station combines both receiver and charger in one to ensure that your mouse is always ready for work (or play). Cruise Control™ system combines two buttons with scroll wheel to ease scrolling through long documents or web sites. Quick Switch Program Selector moves you between active documents and programs. Two thumb buttons let you move forward or backward between pages. Sleek contoured shape fits snugly into your right hand. The MX Optical Engine captures 4.7 megapixels of information per second, more than 60% more than other leading mice. Why is that significant? Because when more image data is captured and analyzed each second, more data is available to determine motion... increasing the mouse's ability to track on difficult surfaces or during quick movements. A mouse's sensor needs to “see” small surface details to track motion. The more detail captured within each image, the more data will be available for calculating movement. The MX Optical Engine captures images that are over 80% larger than those from other sensors on the market today. This contributes to the smooth, fluid tracking on traditionally difficult surfaces, such as wood desktops or other surfaces with repetitive patterns. Another fundamental factor that determines how well an optical mouse performs is the quality of the images it captures. Since the lens is just a fraction of an inch above the tracking surface, and the actual size of the images is very small, even slight variations in manufacturing tolerances can result in blurry images which seriously degrade tracking quality. Logitech designed a proprietary new lens for the MX Optical Engine that improves the depth of field. The result: more details are captured in each image with greater clarity . Optical sensors must employ sophisticated software to analyze the incoming images and determine motion. The intelligence of the software affects performance immensely, especially when the mouse is used on difficult surfaces or pushed to its limits. I used this mouse in 2003 to 2005, after I left it in a box until 2011, i forget it 6 years in a box and now it work very well, it's very impressive and the battery worked like 13+ hours of continuous time, 10/10 !! Bought it back in 2004, have used it ever since and it's still working well. Some dust collected under one of tha buttons but it's possibly to blow it away. Wonderfull quality. I guess logitech won't produce anything so long lasting again. This mouse is over six years old and is no longer sold. I think the successors are the Logitech MX 1100 and the more expensive Logitech MX Revolution. Love it.......does anyone know where i can get one??? Holy Cow! I still have mine that I originally purchased in 2003. I remember it was one of the first wireless mouse suitable for FPS gaming since it is so responsive. Amazing workhorse! The only wear are the rechargeable batteries that probably need replacing soon, and the thinning silver paint on top from all the wear. Thanks for the 1700mAH tip! I have the similar problem with the contacts, but make sure you wipe BOTH of the gold contacts on the base unit and on the mouse, since the base unit will accumulate a lot of dust and you will lose contact. I have had this mouse and keyboard set for 4 years and have had very few issues with it. The only concern, as previously mentioned is you need to wipe the contacts prior to replacing the mouse on the charger. In addition, the other frustrating thing is I needed to replace the re-chargable batteries, you must you 1700mAh batteries, I have used 2500mAh but it doesn't charge them, and after a full night on charge it only lasted 20 mins, so rememeber when buying replacement batteries buy the 1700mAh batteries. if people are having docking problems, be sure to wipe the little gold-colored contacts on the bottom of the mouse before docking in the charge station. 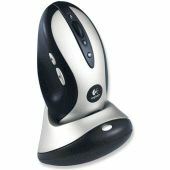 I have used the Logitech MX700,for approx. 2 yrs. It was given to me secondhand,and all I did,was plug it in,and customize it.I have never had a problem,and even though I am left-handed,it is very easy to undersdtand,I love it! I have owned the product for around 5 years.. I bought it second hand and it has lasted through constant daily use all of this time. The scroll wheel has become a little harder to rotate and the right mouse button is a little sticky now so it's time for another... I have looked at the MX revolution but I really don't think they are built as well as the mx700... I think the MX700 could survive a pretty good beating.. the MX revolution feels like it'll cry like a baby as soon as it takes a little bit of abuse.. I've searched and found a new MX700 on ebay :) Gonna go down the tried and tested route.. better the devil you know as they say. well i got a mx700 for xmas from my fiance's brother but he never gave it too me with any packaging or directions or anything so I am not sure whether or not it comes with disks you have to load into your computer or what. but i put batteries in it and i have it on the charger and pluged into my laptop i have pushed both the connect buttons and i cant ger it to work!!! i am getting frustrated because i dont know whats going on because aparently he decided i didnt need the package and directions. any help would be greatly apprecated!!!! I've had this mouse for four years now. It started dying a couple months ago. That is, it doesn't left click, hold & grab, like it once did. I'm looking to replace it. The newer ones, are very impressive, so I may even search for another one. Four years isn't bad, but not great. It also has a docking problem, where it just doesn't dock right, all of the time. I changed out the batteries, but I think it's more than that. Sad Logitech won't answer a repair facility question, because I really enjoy this mouse. It's KVM'd via PS-2 & works great on either computer, w/o the software. I also have the tailed Mx500 which I use for my laptop, & it tracks like a bear. The smaller one I gave to a friend who has little hands. She likes it, can't remember the number. Anyhow, if anyone comes across this & is looking for the Mx700, buy it. Though it can get quirky when you KVM w/both computers on. Oh, the battery life concern. Obviously someone wasn't using their computer much. The battery life is around ten hours when playing games. Just park it on the charger for a few minutes, & you'll get a few more hours to play. I recharge mine every time I turn the computers off, so that does take a little life out of the batteries, over time (divided into four years). Hello, i just got the mx700 today. I plugged it in and let it charge for about 3 or 4 hours. As soon as i got back home ot use the mouse, i noticed that it was responding very well. I downloaded the latest version of the device, paired up with a Logitech Elite keyboard, and still noticed one problem. At certain points, the mouse would not move on my screen. It seemed as if the mouse was low on battery or the mouse itself didn't pick up any of the RF signal. Has anyone experienced a drop in signal or no response from the mouse? If so, please let me know. Thanks! amazing mouse. Used a logitech cordless optical before I bought this one and it was worth the 150CDN I paid for it. Very responsive, very comfortable. The cradle is a great addition, pop it in the charger every ohhh 5 days and it stays nicely charged for the week. Excellent product. I own this mouse, I didn't think twice about getting new batteries for it, even before trying the first ones. Devices never come with good batteries. I replaced them with some Energizer Rechargeable batteries and I can go at least a week of forgetting to charge it (and I really use this mouse), with a full charge taking about 2 hours. I find it the best wireless mouse out there, even with it really dead when I realllly forget to charge it, I continue to work on the machine while removing the mouse for a couple seconds to do somthing I can't do with the keyboard. Great mouse, expensive, but REALLY worth it. While I cannot disagree that the mouse is expensive, I will argue that the battery life on the mouse is no problem. The batteries only need to last a "couple of days" if you use the mouse continuously for a "couple of days." If not, then just set it in the cradle when you go home at night (or in the morning). Or when you go to lunch. I thereby upgrade your rating from 9/10 to 10/10. Hold up, you're complaining that you can only run a set of AA batteries for 3-4 straight days, because you're too damned lazy to drop the mouse in the charger at night? Oh ya I forgot. One more thing. And after reading the second page completely you will find out he mentions exactly how to charge the damn batteries... You have to be the most incapable person in the United States if you cannot figure out how to press a button that specifically says that it has the rest of the review on the next page... Don't even bother trying to prove me wrong, just go sit in your parents basement and cry as a result of your stupidity. To the moron commenting the reviewer... Did you press the button to go to the next page of the review. If you did you would find the contents of the box in which you buy the mouse. You will see that it comes with 2 double A rechargeable lithium batteries and a recharging station. Maybe you should put 1 and 1 together and realize lithium batteries in our present time...2003 are used to be recharged and not discarded after use. Just a point about the reviewer not the mouse. Maybe you should find a reviewer that has some experience! This is the first cordless mouse you have used... So how can you make any judgement about how it handles. I also think you missed the point a bit - this mouse is designed to be charged when not in use... i.e. you stick it in the cradle when your not using it. Therefore 3 days of battery life is not really a negative point if its constantly recharged. Oh yeah - not once did you mention that the mouse was rechargeable!! LOL - won't read a review from here again - worthless.